Because my activities on 23cm are very low, I replaced my Diamond X5000- (23cm/70cm/2m) by a V2000 (70cm/6m/2m) vertical antenna in the expectation that 6 meters is more something for me…. I first modified the X2000 antenna by extending the 3 radials to 1.52cm, so the vertical would react like a ground plane antenna on 6 meters. I made the extension with 6mm aluminum tube from the local do-it-yourself store (Gamma). 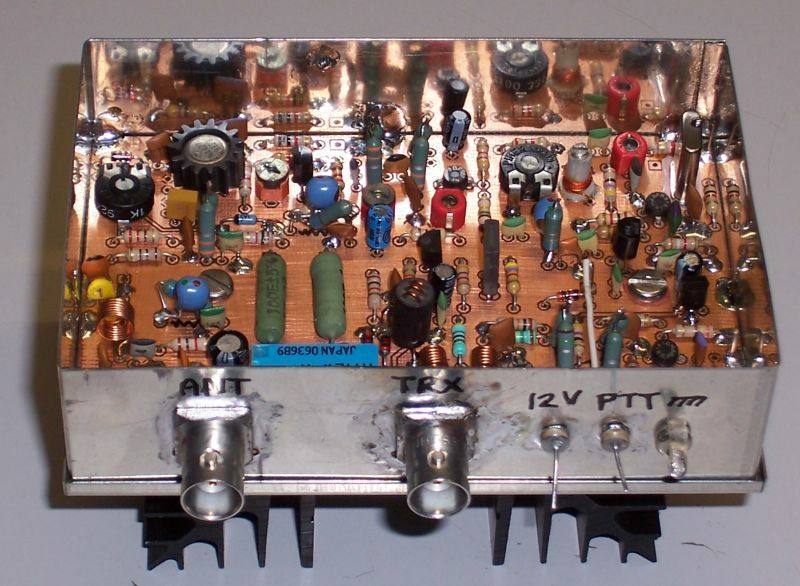 This was an idea of Richard, PA3CGG but you can find this modification also on the Internet. – DF2FQ Holger Eckardt: ‘Transverter für das 6m Band XV6-2‘. 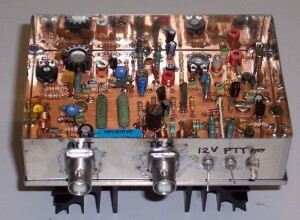 2 meter => 6 meter transverter. I first built the XV6-2 transverter (Holger was so friendly to sent me the pcb lay-out, because he did not sell the kit anymore). It was not easy to get the 94 MHz x-tal, but Holger had some spare x-tals in stock and helped me. Another difficult part to get were the .47uH coils. I find them on e-bay for a reasonable price. But first I made them by using .33uH and .15uH in series. On the pictures below you can see a couple of those. 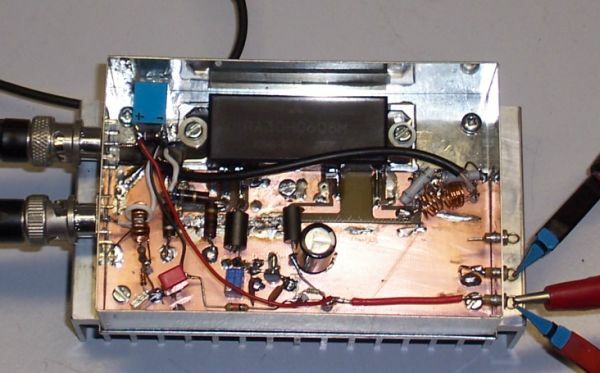 Building this transverter was not very difficult. A friend of mine had made the PCB (double-sided!) by hand and for that reason there were some small mismatches in aligning the component holes. That was the reason that at first the input power was not adjustable. It cost me a lot of time to find out that there was a small short circuit below the trimpot holes hi! Below the relay I had to make through-hole wires to make a connection between the pads on both sides of the PCB. Also the x-tal oscillator was not stable and turned off very easy. I changed the .1uH inductor by a real coil (see below, just right of the trimpot) and problem solved. The only thing I have to repair is the slow reaction of the T/R relay after going from transmit to receive. The RC time is to long. The measured output is about 8 Watt. In the meantime I reduced the slow fox time by adding a resistor to the RC circuit. I also modified the local x-tal oscillator to a later design of Holger because the oscillator was not stable. From a good friend a have got a RF power module: RA30H0608M. 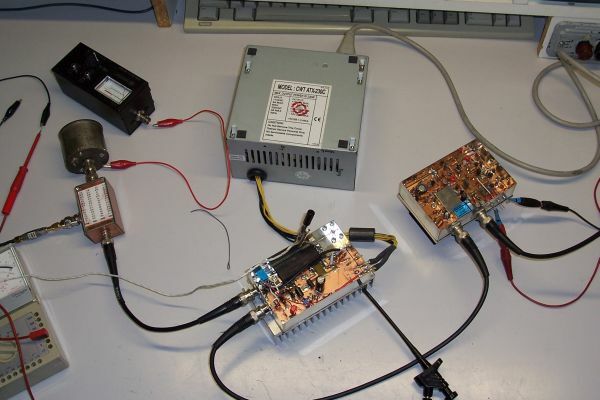 This module is a 30-watt RF MOSFET Amplifier Module for 12.5-volt mobile radios that operate in the 66- to 88-MHz range. SSB, CW and FM Operation. But also works well at 50MHz! 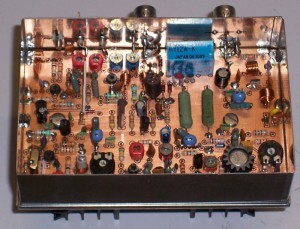 With help from the schematic of the VHF packer I build the 6 meter RF amplifier. It’s working great! I used an old PC power supply and increased the output voltage to 13.5 Volt and measured an RF output power of the amplifier around the 30 Watt.